Sunny days and below freezing nights in the months of February and March in Maine are perfect conditions for the Maple trees sap to start flowing. The Maple Syrup producers are working around the clock to turn that sap into the sweet syrup we all know and love. Like wine, maple syrup varies year to year depending on the weather; and from region to region with the variables in the soil and terrain. The northeast United States have ideal conditions for the maple tree (Acer Saccharum) or “sugar maker” as true New Englanders call them. 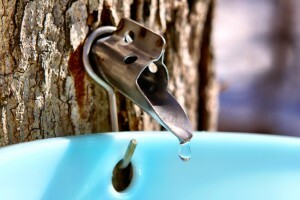 With our sunny days and crisp, below freezing cold nights, our spring climate is perfect for these trees to produce the sugar in their sap that can be boiled down into Maple Syrup. 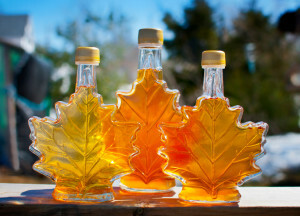 There have been attempts to produce maple syrup in other parts of the US, and Europe tried and failed to establish the industry. While the trees grew fine, they didn’t produce enough sugar in the sap to make syrup. The sap usually starts flowing in early March, but the warm winter this year has meant that the producers have gotten an early start and are now in full swing production mode. Much of the sap is still collected in the way it has been done for hundreds of years; by tapping the tree and hanging a bucket. Some of the larger producers run the sap from the tree straight to their sugar houses with hoses. A large tree can produce 40 – 60 gallons of sap without causing any harm to the tree. While that sounds like a lot of sap, once boiled down, it only makes about a gallon of syrup! In addition, once collected, the sap spoils within a matter of hours so syrup makers work around the clock to produce their syrups. A sugar house can be easily spotted by the billowing clouds of steam rising from the chimneys as the sap is boiled down in large vats. To celebrate the maple syrup production, Maine Maple Sunday is held on the fourth Sunday in March every year. Sugar houses across the state throw open their doors and invite you in to see their production process and sample their syrup. Many have small stores that sell Maine Maple made products. There are a number of sugar houses close to Kennebunkport that we recommend if you find yourself in the area that weekend. Douston Maple and Honey in Arundel, ME are a 10 minute drive from the Inn and will be open to the public March 27th, 2016 from 9am – 1pm. Chase Farms in Wells are about a 20 minute drive from the Inn and operate as a year around farm. They will be open March 26th and 27th from 10am to 4pm to let you get an inside view of their syrup making process. In addition to free samples of maple products, they offer wagon rides, barn tours and face painting. Don’t worry if you miss Maple Sunday. You can pick up a bottle of our locally produced syrup anytime your travels bring you our way! We hope to see you soon.